Heavenly blog! : No. 848: King Harald V encourages kind words, but Satan is loose and he must be defeated, revealed and defeated! No. 848: King Harald V encourages kind words, but Satan is loose and he must be defeated, revealed and defeated! King Harald V encourages kind words, but Satan is loose and he must be defeated, revealed and defeated! Even King Harald famille, where himself Princess Martha Louise's in with her, and it leads people into the occult and away from the faith in the true God and faith in the Lord Jesus Christ. This is supremely something satan will and must be disclosed. We must also be aware that the evil also sends his angels. Angels are real, but to begin and focus on angels are God's word, it is only Jesus who can save. Image of Jesus who is Lord of angels. Without him and his name mentioned, no true angels operate. Joshua 5. 13 Once Joshua was by Jericho, he looked up and saw a man who stood before him with his sword drawn in his hand. Joshua went to him and said: "Are you with us or for our adversaries?" 14 The man said, "No, I'm the leader of the Lord's army. Now I am come. "Joshua fell down on his face and said," What does my Lord say to his servant? 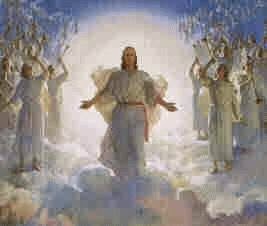 "15 The driver of the Lord's army answered Joshua," Take off your sandals, for the place you are standing is holy. "It did Joshua. This was none other than Jesus, who led and leads the Angels today and forever! What is it Satan wants us to do? The fact that his own daughter is doing to encourage, engledyrkelse as Bible warns strongly. From my commentaries Colossians Dispenser letter 2. 17 All this is just a shadow of what was to come, but the body is the body of Christ. Here we get an even dose. This Paul mentions here is very important to understand God's method and what is the validity and importance today. What is the reality? The shadow or actual person? The person of course and that is Jesus Christ. It is Jesus who is the shadows of reality in the entire Old Testament. Not the law, regulations ceremony, festival, new moon, warrior, ordinances or anything else but Jesus Christ. All this is pictures, examples of what Christ is and represents. It looks like they had been misled to believe that an angelic revelation was of greater spiritual value than a Christ revelation ?! That they let unnatural and much emphasis on revelation is sure. But with the intention to get it to trust and believe more in angels and other revelations one in Christ and God's word. Angels mission is nothing new, the seduction was also the first Christians faced. We believe in angels revelations and other revelations. But is the word of God and it takes attention away from Christ and the word of God? Do it, reject it no matter how nice and humble it sounds like. Engel revelations are as a supplement to Christ revelations and God's word. 19 and will not obey Him who is the head. But from him expires whole body growth as God want it to be, and the body is supported and held together by every joint and ribbons. It's about to stick his head, Christ. Where the body is controlled from? Head. We as the Body of Christ should always be controlled by head of he we get our spiritual growth. When all other believers also do the same. Lives in with Jesus complements and supplements we each other like body our doing it. There is always a strength for the body to build up more joints of the body. It occurs when we all get a larger and more accurate view of Christ. What is Princess Martha Louise believes in really? It is the first children and those living with God who has an angel at his side, no other. In other words. It is a dangerous doctrine and seduction. Here it does not help with so-called kind words, but to call a spade a spade. It is fraud, occult and directly to God's word that Martha Louise doing! Here, a search back to ancient Norse mixed with angels, it is God's word direct demonic and I would warn against strongly to have something that totally doing, it is pure fraud, deception and seduction! No non believers have something "good" that leads them, they are ruled by the evil scripture says. From my commentaries Ephesians 2. 1. You were once dead in trespasses and sins. Isaiah 59. 2. "There are sins that stand between you and your God. Their sins hide his face, then do not hear you. " Iniquities = wrong doings that separates us from God with a deep ravine. Synder = miss the mark with our lives. When disappears God for us. Blessing says: "The Lord make his face shine upon you and be gracious to you." But sin hides God's face so it does not shine upon us so we can get grace. 2 You lived on the current world view and let you lead by the ruler of the air's, the spirit that now worketh in the disobedient. Paul addresses himself with: "Yes, we lived once all that they. We followed the lusts of our sinful nature and let us be guided by it and by our own thoughts. How we were by nature under God's wrath, even as others. "Ef.2,2-3. There must be a before and now in a person's life if they want to listen to Christ. There is no question of being better than others, but to become a Christian requires a break with this world sinful creature, and a surrender to Christ. "That was before his conversion, Paul thought about himself that he was better than everyone else . In Philippians he writes: "I have indeed what I can show human advantage. If anyone thinks that he can rely on such a thing, can I do it even more. "But after his conversion, the tone was different:" We glory in Christ and does not put our trust in anything human. "By this clear Christ Confession came he opposed relation to the people and to future religious leaders. But after meeting with the resurrected Jesus Christ was an impossibility for him to preach something different gospel than he had received. The Holy Spirit had clearly revealed to Paul who he was. "I know that in me, that is the way I am in myself staying no good." He maintains both for themselves and for everyone else that only path to salvation was to turn to Jesus Christ to receive it unmerited grace and forgiveness from him. He even got to experience the persecution that he had previously initiated against the Christians. But he previously burned with hatred against Christians, now burn with love for both Jews and Gentiles. "I have great sorrow of heart. Something that always torments me. I'd love to be accursed and separated from Christ, it was only to help my brothers and countrymen. "Rom.9,3. It is not difficult to registers that they antichristian powers are effective today. It goes both preaching and forms. The most active to pursue Christians are precisely those who think about themselves: "I have right-enough what I can show of human advantage." When both mayors, politicians, diocesan council and the media oppose one episcopal candidate because he chooses to stand on Scripture, they all combine to reveal the large separation there is between this world and the kingdom of God. Actually, this is only natural, Paul writes in Corinthians: "To a man is in itself, it does not receive the things of the Spirit of God. For him it is foolishness, and he can not comprehend it; it can only spiritually discerned. "" As soon dichotomy tages away is that being a Christian vrøvel. " 3 Yes, we lived once all that they. We followed the lusts of our sinful nature and let us be guided by it and by our own thoughts. How we were by nature under God's wrath, even as others. All people are not intellectual neutral. Either we are influenced by God or Satan. By the fall so was all mankind "sold" to Satan. At Calvary, all people "won" back to God. Here is Trygve OBI about Martha seductive and mislead angels who are either fantasy or demons that operate. Finansavisen editor Trygve OBI writes in an editorial about Märtha Louise angels - the new tool in the financial sector. It's no secret that we are skeptical englekontakt and conversations with horses, but after that Princess Märtha Louise and her partner Elisabeth Samnøy has taken Italy by storm, we've begun to wonder. Märtha Louise attended namely an international englekonferanse outside Turin at the weekend and there could Italians who were willing to pay about 3000 kroner, learn how to get in touch with angels and how to communicate with them. This can of course blow off, but this time told the princess that angels can help people in the financial industry. As an example, said Martha Louise, according a report in the newspaper Dagbladet that she at one of their courses in Oslo school Astarte Education had had a very bad stockbroker pupil, but having completed the course got stockbroker contact with angels, integrated them their work and the angels told him what to invest in. With Märtha Louise's words: "He sailed up as one of the best stock brokers. Angels can be used for everything. " The Italian audience was wildly enthusiastic. Who will not be a winner on the exchange? "Open up your heart and say yes to the angels," said the princess. Thus did Märtha Louise also sold more of the book "Meet your guardian angel" who has now sold 36,000 copies in nine countries. Price in Italy: 110 million. Of course this is only the beginning. If bad stockbrokers may be ones after a course of Astarte Education, then so can investors skip broker wrist and even become ones in stock picking for a course at Märtha Louise. After a thorough conversation with angels, we know about it is Seadrill Kjell Inge Rokke or drill company that becomes a winner, whether Statoil continues recovery and REC are coming down or up. Oil prices, which are becoming harder to predict, certainly has an angel also answer. An intermediate or poor investor quickly becomes a successful investor after a conversation or two with an angel, and contact with the angels gets with Märtha Louise help. Today (last Tuesday) we will lead a board meeting of Hurtigruten Tromsø, and we are planning a direct line to Märtha Louise or an angel directly, to get the answer to this year's challenges. Demand, exchange rates, absenteeism, coatings, reliability, budgets, accounting and heavenly trips along the coast and Spitsbergen. We will open the heart as well as we can, and we will encourage the directors to do the same. We have previously criticized the princess for deceptive marketing, but she manages, with his angels, to get a bad stockbroker to become one of the best, all the doubts cleared off the road. The question is, however, whom we should sue if stock councils do not measure? Märtha Louise? -Law? Ari Behn or parents Harald and Sonja? It gets a bit as with complex savings. Can we take the bank and Rune Bjerke or we must admit that we do have a responsibility? We promise a full house on the next Astarte Education courses. Now angels with us and main index is rocketing. King Harald is another good man. But to take his advice and guidance here is enough to miss the target. Satan is loose, and in his own family is unfortunately one that operates in such a way that one must warn against when it is directly seduction, demonic and dangerous! Unfortunately it seems that the more sin to gain a foothold among people, especially among the Christians there including remarriage is very prominent. So will need not only use kind words but also cautionary words. Be the exigency! I believe in angels, and englebeskyttelse. With it's primarily for children and those who believe in the Jesus Christ. The unsaved who are experiencing this, first and foremost those being prayed for. For the other it says in Scripture that it is the Spirit who is from Satan that works in them. They live and walk in darkness. It is here Marta Louise goes so wrong. Without Jesus, no true angels operate. Jesus is the captain of the Lord's army where the angels are the battles. Therefore, no true angels operate and function without the name of Jesus and his power and authority are there present!